The SpaceX Dragon was pictured May 31, 2012, moments before its release from the grip of the Canadarm2 and its departure from the space station. 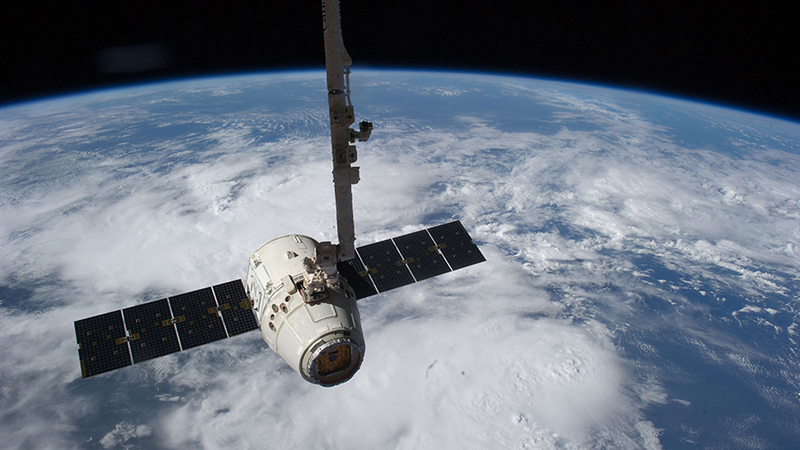 Due to a forecast of unacceptable sea states in the Pacific Ocean in the prime opportunity splashdown zone, SpaceX and NASA have elected to delay the return of the SpaceX Dragon cargo craft to Monday, July 3. The splashdown zone for Monday has an acceptable weather forecast and is closer to port in Long Beach, California. Splashdown is expected around 260 miles southwest of the California coast. 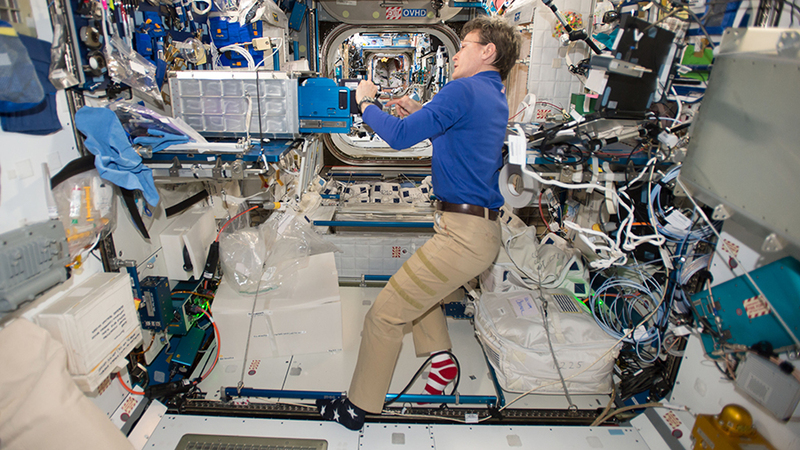 NASA TV coverage of the departure of Dragon Monday, July 3 will begin at 2:00 a.m. EDT for a release at 2:28 a.m.
NASA astronaut Peggy Whitson works on a science experiment in the Unity module. A pair of NASA astronauts are almost finished packing the SpaceX Dragon resupply ship and are training for its Sunday morning departure. The three-member Expedition 52 crew also explored life science researching microgravity’s effect on microbes and plants. Flight Engineers Peggy Whitson and Jack Fischer will be inside the Cupola Sunday to robotically release Dragon at 11:38 a.m. EDT. They duo trained today to prepare for Sunday’s departure activities. The astronauts are also nearly done loading Dragon with time-sensitive research samples and used station hardware for analysis on Earth by scientists and engineers. The commercial space freighter will parachute to a splash down in the Pacific Ocean about 5-1/2 hours after release. A SpaceX team will retrieve Dragon from the ocean and ship it to port in southern California. NASA engineers will then unload Dragon on shore and return the cargo back to Houston for analysis. Today’s life science activities included photographing mold and bacteria samples for a suite of student-designed experiments. Finally, microbes that have been swabbed from station surfaces are set to be examined for extremophiles, or microorganisms that live in extreme conditions that are normally hostile to life. The aurora and the starry night are pictured above Earth’s atmosphere in this photograph taken from the space station’s cupola June 19, 2017. Onboard the International Space Station today, the Expedition 52 crew continued packing the SpaceX Dragon resupply ship for its departure Sunday morning. The crew is loading Dragon all week with scientific samples and station hardware for splashdown and retrieval in the Pacific Ocean. SpaceX personnel will take a two-day boat ride with Dragon onboard and return it to port in southern California. NASA engineers will then unload Dragon on shore and ship the cargo back to Houston for analysis. Meanwhile, the three station residents today continued exploring space science and gearing up for a Russian spacewalk. The trio also inspected safety gear and maintained station life support systems. NASA astronaut Jack Fischer worked on the Electrostatic Levitation Furnace that levitates, melts and solidifies materials for physical research. He later joined Flight Engineer Peggy Whitson and stowed frozen science samples inside Dragon. Commander Fyodor replaced gear on a Russian spacesuit and checked it for leaks. 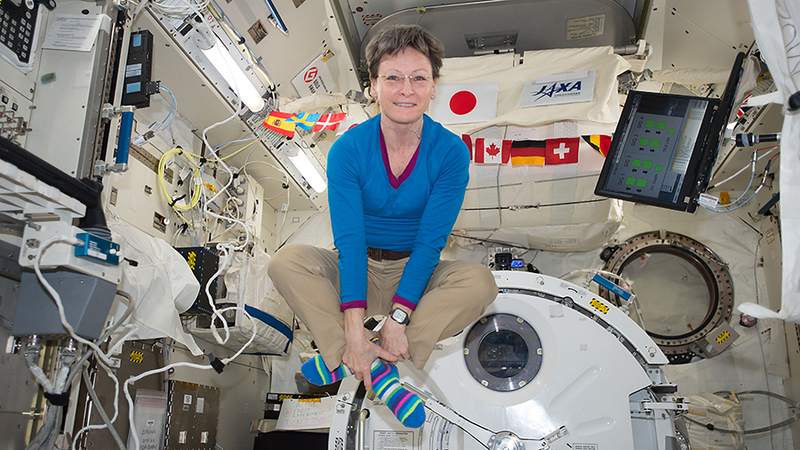 Astronaut Peggy Whitson floats inside Japan’s Kibo laboratory module. Expedition 52 explored the aging process in space today and measured the lighting conditions on the International Space Station. The crew is also getting spacesuits ready for an upcoming Russian spacewalk. Flight Engineer Peggy Whitson swapped out stem cell samples today inside the Microgravity Science Glovebox for the Cardiac Stem Cells study. The experiment is researching spaceflight’s effect on accelerated aging and may provide a treatment for heart disease on Earth. Scientists are observing the stem cells in space to determine their role in cardiac biology and effectiveness in tissue regeneration. Whitson also set up light meters to measure the intensity and color of new LED (light-emitting diode) light bulbs installed in the station. The data is being collected for the Lighting Effects study to determine how the new lights affect crew sleep, circadian rhythms and cognitive performance. NASA astronaut Jack Fischer checked out Russian Orlan spacesuits with Commander Fyodor Yurchikhin this morning. The spacesuit maintenance work is doing being done ahead of a Russian spacewalk planned for later this year. 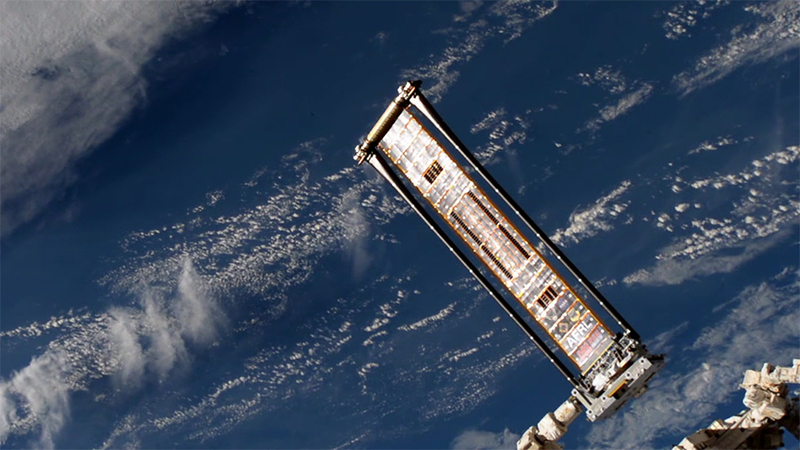 The ROSA, Roll Out Solar Array, is pictured shortly after it was jettisoned from the tip of the Canadarm2. An experimental solar array demonstration was jettisoned while the Expedition 52 crew continued preparing the SpaceX Dragon for its release on Sunday. The three crew members also studied how microgravity impacts their bodies. Following a week of successful science operations on the experiment for the Roll-Out Solar Array (ROSA), attempts to retract the array were unsuccessful. The ISS Mission Management Team met Monday morning and made the decision to jettison ROSA directly from its location at the end of the space station’s robotic arm, where it remained fully deployed in a normal configuration. The original plan called for ROSA to be stored back inside the trunk of SpaceX’s Dragon which is detached and burned up in the atmosphere during Dragon reentry. The Operations team executed the jettison procedure that was developed as part of the pre-flight planning process that covered various scenarios. Once jettisoned, ROSA will not present any risk to the International Space Station and will not impact any upcoming visiting vehicle traffic. ROSA is an experiment to test a new type of solar panel that rolls open in space and is more compact than current rigid panel designs. The ROSA investigation tests deployment and retraction, shape changes when the Earth blocks the sun, and other physical challenges to determine the array’s strength and durability. The SpaceX Dragon cargo craft is one week away from departing the International Space Station. NASA astronaut Peggy Whitson continued packing Dragon this morning with used hardware and research samples for analysis back on Earth. Dragon will be released from the Canadarm2 Sunday at 11:38 a.m. EDT and splash down in the Pacific Ocean about 5-1/2 hours later. Whitson then joined Flight Engineer Jack Fischer in the afternoon to wrap up the Seedling Growth-3 experiment. The botanical study is exploring how the lack of gravity impacts light sensing and growth in plants. 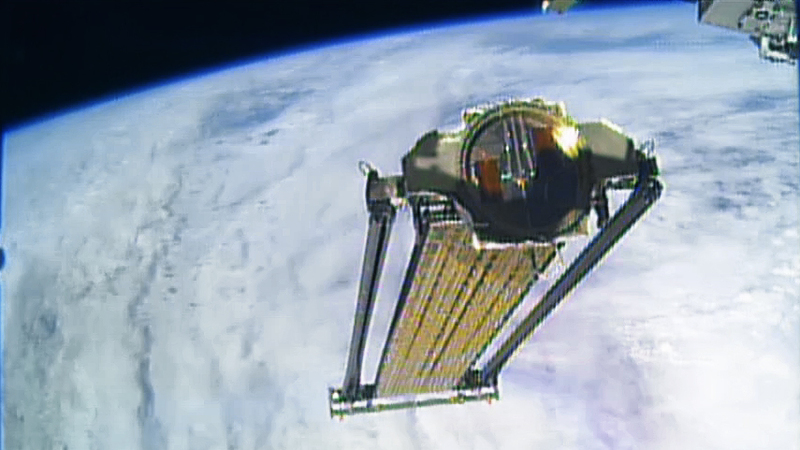 Plant samples from the study will be returned to Earth on Sunday inside the Dragon resupply ship. Commander Fyodor Yurchikhin, along with Whitson and Fischer, took body measurements today to help scientists understand how living in space affects body size. The crew also collected blood, urine, saliva and breath samples for more insight on astronaut health. Expedition 52 crew members Fyodor Yurchikhin (middle foreground) and Jack Fischer were inside the Zvezda service module monitoring the docking of a Russian Progress 67 cargo ship on June 16, 2017. The Expedition 52 trio worked throughout Friday on human research studying cardiac biology and the microbes that live on humans. Tiny satellites inside the International Space Station were also investigated for future remote or autonomous use in space. NASA astronaut Jack Fisher collected microbe samples from his body and stowed them inside a science freezer for later analysis on Earth. He also activated an ultrasound and scanned his legs for the Vascular Echo study that is exploring how veins and arteries adapt during a spaceflight mission. 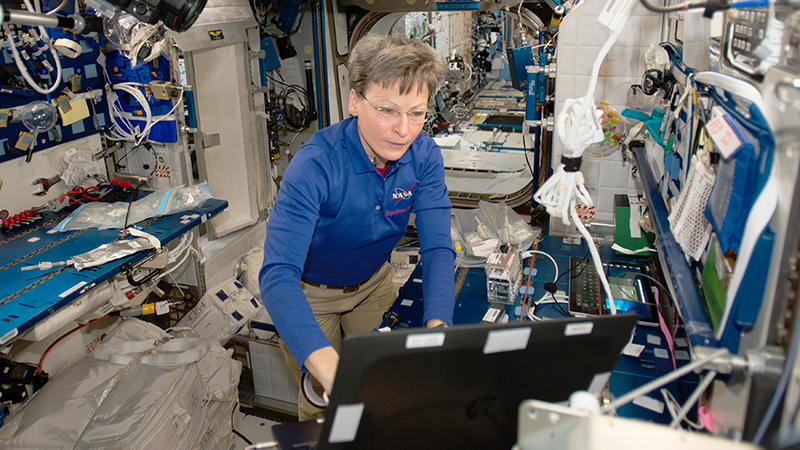 Three-time station crew member Peggy Whitson retrieved stem cell samples for observation to determine if living in space speeds up the aging process. Whitson then set up the SPHERES Halo experiment that is exploring the possibility of using satellites to clean up space debris and assemble objects such as space telescopes and habitats. Commander Fyodor Yurchikhin worked in the station’s Russian segment maintaining life support systems. The veteran cosmonaut also explored pain sensation in space then wrapped up the work day with Earth photography documenting human and natural impacts across the globe. Astronaut Peggy Whitson checks out new science gear inside the Harmony module. The SpaceX Dragon is attached to the Earth-facing port of Harmony. Expedition 52 is continuing to explore a new drug therapy today that may keep humans healthier in space. The trio onboard the International Space Station also worked on standard maintenance activities to keep the orbital complex in ship-shape. Astronauts living on the station exercise a couple of hours every day to offset the muscle and bone loss experienced in microgravity. A new injectable drug is also being explored as a way to maintain strong bones during spaceflight. Flight Engineers Peggy Whitson and Jack Fischer of NASA are testing that drug today on mice for the fifth version of the ongoing Rodent Research experiment. Rodent Research-5 is testing the drugs ability to stop and reverse bone loss in space and may help patients with bone disease on Earth. Fischer also worked on light plumbing duties and microbe sampling throughout Thursday. Whitson also worked on microbe sampling and set up life science gear ahead of a new experiment to be delivered on the next SpaceX Dragon cargo mission. Commander Fyodor Yurchikhin checked out Russian life support gear and continued unloading new gear delivered last week inside the Progress 67 (67P) resupply ship. The veteran cosmonaut also repressurized the station’s atmosphere using oxygen stored inside the 67P. 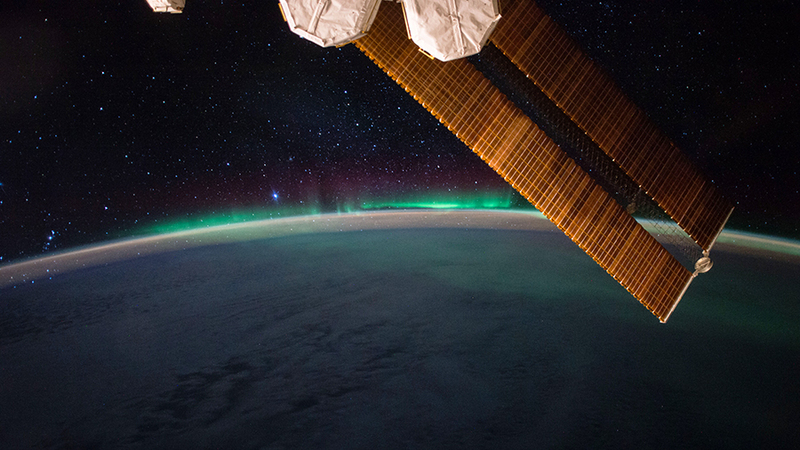 The aurora and the night sky above Earth’s atmosphere are pictured from the space station. A portion of the station’s solar arrays and a pair of nitrogen/oxygen recharge system tanks are pictured in the foreground. The three orbiting crew members living on the International Space Station today explored the effects of microgravity on mice and microbes to understand how living in space impacts humans. Cargo transfers are also underway on the orbital complex after the arrival of the latest resupply ship. A pair of life science experiments observing mice are being worked today to research how the weightless environment of space impacts bones, muscles and the immunity system. For the Rodent Research-5 study today, NASA astronauts Peggy Whitson and Jack Fischer observed how drug therapies on mice may offset the negative health impacts of spaceflight. 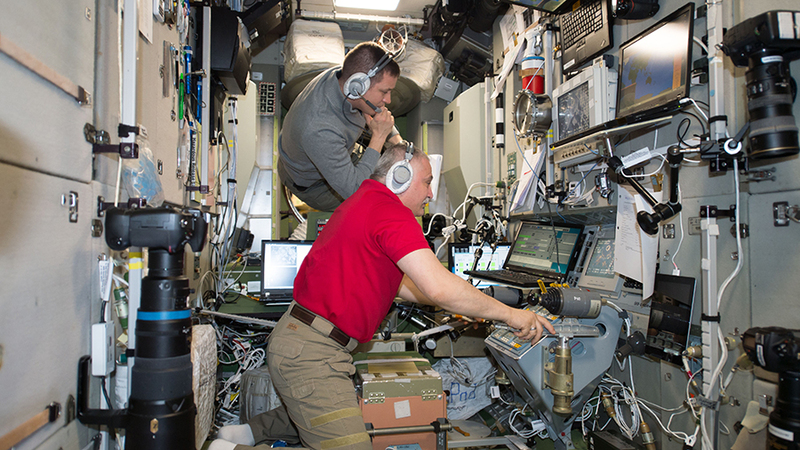 The duo also set up gear for a new study, the Multi-Omics Mouse experiment, which will be launched on the next Space Dragon mission and will evaluate the impacts of space environment and prebiotics on astronauts’ immune function. The crew also collected saliva samples and stowed them in a science freezer for later microbial analysis on Earth. Station surfaces were also swabbed and air samples were taken to help scientists identify the microbes living on the station and how they may change on orbit. Expedition 52 Commander Fyodor Yurchikhin continued unloading the 3,000 pounds of food, fuel and supplies delivered last week aboard the Progress 67 resupply ship. The veteran station cosmonaut also had some time set aside to update the station’s inventory system and check on Russian science experiments. NASA astronauts Peggy Whitson and Jack Fischer are pictured packing up gear inside the International Space Station. The Expedition 52 crew is loading the SpaceX Dragon with cargo for return back to Earth in less than two weeks. BEAM, the experimental habitat, also received a new radiation shield today that was 3D printed aboard the International Space Station. Dragon is due to leave the International Space Station July 2 after cargo transfers with the resupply ship are complete. The crew offloaded new science experiments, spacewalking gear and station hardware shortly after it arrived on June 5. Dragon will now be packed with used station gear and research samples for analysis by NASA engineers and scientists after it splashes down in the Pacific Ocean. Flight Engineer Jack Fischer opened up BEAM today and entered the expandable activity module for a regular checkup. He replaced an older radiation shield with a thicker shield that covers a radiation sensor inside BEAM. Fischer also sampled BEAM’s air and surfaces for microbes. Veteran astronaut Peggy Whitson of NASA spent Tuesday sampling the air and surfaces for microbes in the station’s U.S. segment. Whitson also spent some time stowing synthetic DNA samples exposed to radiation in a science freezer and began readying rodent research gear for return next month aboard Dragon. 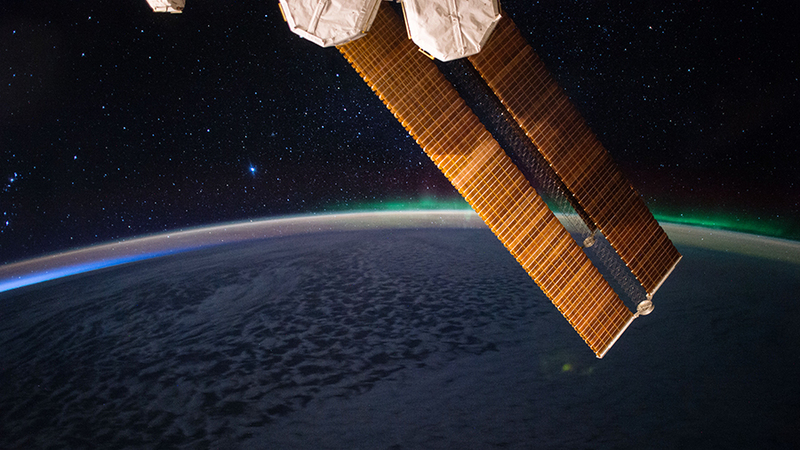 The Roll Out Solar Array, also known as ROSA, was deployed June 18 from the tip of the Canadarm2. Robotics controllers completed the unloading and set up of the third and final external experiment delivered last week aboard the SpaceX Dragon resupply ship. Inside the International Space Station, the Expedition 52 crew studied a variety of life science including plant growth, bone loss and cardiac biology. Over the weekend, engineers on the ground remotely operated the Canadarm2 to extract the Roll Out Solar Array from Dragon. The experiment, also known as ROSA, will remain attached to the Canadarm2 over seven days to test the effectiveness of the advanced, flexible solar array that rolls out like a tape measure. Flight Engineer Jack Fischer and Peggy Whitson set up the Seedling Growth-3 botany study today that is researching how plant cells respond to lighting conditions in microgravity. Fischer also installed samples in a NanoRacks facility for an educational research project that is studying the effects of radiation damage on synthetic DNA. Whitson measured bone loss in mice for the Rodent Research-5 study. Results may improve the health of astronauts living in space and humans on Earth with bone diseases. Whitson later moved onto the Cardiac Stem Cells experiment that seeks to understand the accelerated aging process that takes place in space.